Kase Tidd shows off his award next to his newly-crowned Grand Champion Barrow at the 2018 Delaware County Fair. 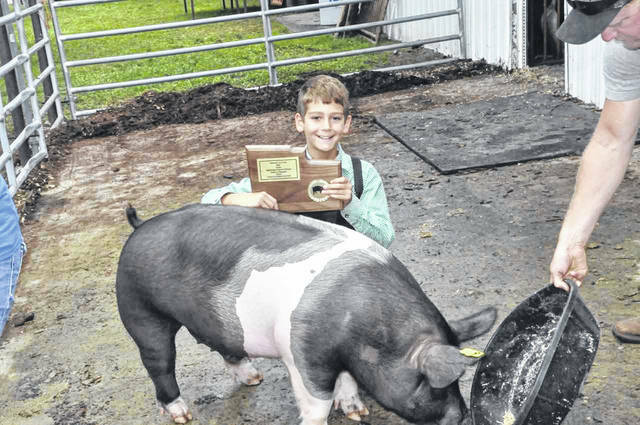 Kase Tidd had himself a banner day Monday during the 2018 Delaware County Fair Market Pig Show, claiming several awards and capping a very successful first year in the show ring for the 9-year-old. Tidd, who is from La Rue and attends Elgin Elementary School, began the day by being named the champion of the Lightweight Barrow Division, winning with a barrow that weighed in at 244 pounds. He would add another class champion with his 273-pound gilt, which won the Heavyweight Gilt Division. But while Tidd had two class champion awards already in hand, his biggest award — the award every exhibitor is chasing — would come at the end of the show with the selection of grand champions. Tidd would again hear his name called, this time as the Grand Champion of the Market Barrow Division. Lilly Henney and her 265-pound Middleweight Champion Barrow were named the Reserve Grand Champion of the Market Barrow Division. Caleb Yarnell would also make the finals of the Market Barrow Division after winning the Heavyweight Division with his 279-pound barrow. Winners of their classes in the Barrow Division were Enzo DiRocco (Lightweight Class 1), Jonah VanGundy (Lightweight Class 2), Sara Steck (Lightweight Class 3), Trinity Smith (Lightweight Class 4), Tidd (Lightweight Class 5), David Burwell (Middleweight Class 1), Hailey Pennington (Middleweight Class 2), Jack Rotondo (Middleweight Class 3), Henney (Middleweight Class 4), Hanah Rhoades (Middleweight Class 5), Jenna Johnson (Heavyweight Class 1) and Yarnell (Heavyweight Class 2). Asked how he was able to clean up with the awards in his first year of showing, Tidd, who also shows cattle, said he is thankful for the people around him, especially his mother, Summer, and father, Kevan, who have helped him. His advice to anyone who is showing or wants to get into showing with hopes of having grand champion livestock one day is simple in principle, but heavy on the effort aspect. “Work hard,” Tidd said while adding there is work that needs to be done daily in order to raise a champion.